← New release and a free read! Finished off the last bit of work for my classes (for now). Yay! I started the last of the Ghost episodes (also for now–there might be a season two). This episode is challenging. It not only has its own story arc, but also the entire season story arc comes to a close in this story. Again, hats off to television writers. This. Is. Challenging. I’m calling this last episode Must Love Ghosts–tentatively (for now). But it’s a lot of fun. As I mentioned earlier this week, Giving up the Ghosts is live. 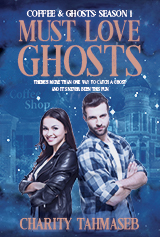 Plus, Ghost in the Coffee Machine is free and it includes a sample of Giving up the Ghosts. So, if you’re uncertain about Coffee & Ghosts, you can give it a no-risk sort of try. Giving up the Ghosts is now live! And Ghost in the Coffee Machine is free to read. If you want to learn more, see my post from a few days ago.